Yesterday I shared my great room dressed for fall as part of a French country fall tour with twelve fabulously talented bloggers and today I'm sharing the other side of the room with my new easy DIY art. This framed art was so super easy to create and the only thing I paid for was the print from here. I knew that the French Oak botanical was perfect for my home. I grabbed one of my framed prints, that I put together years ago, from my stash and got to work. You can find these frames at Hobby Lobby and they are especially cheap when they are 50% off. I also bought a ready made mat and then just took the back off and placed my new print in and voila, I have a fall picture. The reflection of my palladium window is in this shot. I like that the print was aged. I added a throw to the tray under the sideboard for Mr. Savvy to grab when he gets cold which seems to be quite often. 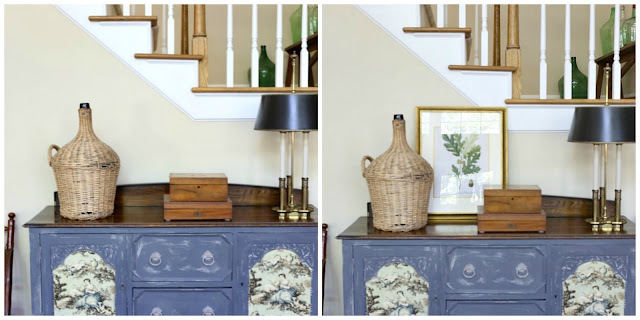 A vintage demijohn and some collected wooden boxes round out the vignette. Here is a side by side to show how the leaning art fills in a void. I hope I gave you an idea for creating a new art piece for very little time and money. 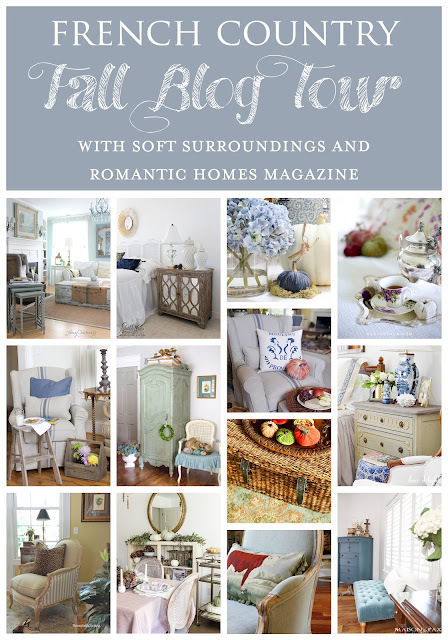 Now, be sure to click on my friends' posts below for more French country fall inspiration! I love that artwork!! !...perfect for Fall and any season for that matter!....great vignette Kim...have a great weekend! That's really perfect for that spot. It is very frustrating here that precut mats are impossible to find. I brought a drawing from my parents' house, without the frame since it was too big, and I cannot find a mat. The print looks so perfect in your entryway! What a nice fall welcome to anyone who enters... :-) I love your sideboard styling, as well! Thanks Lory, but this is the wall in the great room not the entry. i HAVE an old Barnes and noble book with botanicals that I rip off pages from every now and then to make new 'art', and always love it, I should get mats though! Great idea and love your entry! Oh wow, Kim!! There you go again!! I went to the site where you bought your print and had not seen yours first, I would not have given it a second look!! Love that print and it looks great leaning like that. I love art displayed in this way, it doesn't have to be hung on a wall, this gives a slightly modern twist to any piece whether it is vintage or contemprorary. Your Fall updates look great! Another place to get botanicals free are from online archives of libraries. Thanks for sharing. This is the perfect print for fall!